Nothing makes me happier than getting to try a new product without plunking down my hard-earned cash for the privilege. I’d been hearing about Boots for some time, and once the line arrived at Target, it was only by physical force that I could be removed from the Health and Beauty aisles. So many products, none of which I’d tried, and where to start? Thankfully, Boots saw fit to provide samples and knowledgeable employees to Target stores, and I walked away with about two weeks’ worth of No7 Restore & Renew without lightening my wallet. And now, dear readers, the results are in! 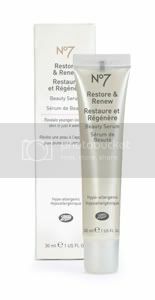 Boots recommends using No7 R&R for about four weeks to see reduction of pores, fine lines, and an overall restoration of youthful skin. I’ve got this fabulous makeup mirror with the 10x magnification side – you know, the one we never use because we’d rather NOT see all those imperfections up close and personal first thing in the morning – and I made a point of giving my face a good hard look before my first use of Restore & Renew. Then, I told myself to give it some time, use it every day until it was gone, and see what happened. Here we are, a week and a couple of days later, and let me tell you, I didn’t even need to go back to the magnified mirror to know that this stuff works. After ten days’ use, I can *feel* the difference in my skin when I apply the serum, followed by my usual moisturizer. The area around my nose and my chin are the “trouble spots” for enlarged pores, and where I didn’t have to before, I now need to get right up to the mirror and truly LOOK for my pores. My skin appears smoother, more uniformly colored, and has a radiance I didn’t know was missing until I got it back. I leave my face naked but for a dusting of mineral finishing powder, which also goes on more evenly than it did a week ago, and that’s all it takes to eliminate those imperfections I generally have to work to cover and mask. The product itself is thick and a bit paste-like; I have to remind myself that it’s a *serum* and not a moisturizer. It’s not meant to feel completely weightless – it’s got work to do, and that requires a bit more substance. It feels good, though – like a thin mud mask that you rub in rather than letting it sit on the surface. It takes only moments to completely absorb into the skin, and doesn’t leave a shine, so you don’t have to apply a powder over it if you don’t care to. A very small amount covers my entire face and neck, and there’s only a faint scent – more medicinal than fragrant – which doesn’t linger past application. It’s no wonder Restore & Renew is flying off shelves everywhere; we all hear the hype about every new anti-aging system, every recommended proactive measure for maintaining your skin’s elasticity and tautness, every cream/toner/cleanser that’s going to turn back the years. Finally, there’s one product, applied in seconds every morning, that delivers on the promises made by every skin care company known to femme. Head to Target or CVS and see if you can grab up a bottle of this serum before it’s sold out; by the time they get it back in stock, you could already have seen the results for yourself. Have a product you want your Retail Private Eye to investigate before you buy? Email me at Frugal (@) Femme Flavor (.) com! Thanks for introducing me to this product. I think I should go for it.